When choosing the best bond funds to buy for you, the process of researching and analyzing can become challenging, especially considering all the different types of bond funds, various mutual fund families, and thousands of individual funds to choose from. There's bond index funds, corporate bond funds, U.S. Treasury bond funds, high income (junk) bond funds, foreign bond funds, emerging market bond funds, municipal bond funds, short-term bond funds, intermediate-term bond funds, long-term bond funds, treasury inflation-protected (TIPS) bond funds, multi-sector bond funds, and the list goes on. But instead of you having to sift through dozens or even hundreds of mutual funds, we've narrowed down the choices to a list of the best bond funds in just a few different categories that work well for the majority of investors — the long-term investors that are looking for high-quality, low-cost bond mutual funds. Vanguard Total Bond Index (VBMFX): This bond fund holds thousands of bonds, which combine to form the entire publicly traded US bond market. So when you're ready to expand your portfolio and balance the risk with a low-cost, diversified bond index fund, VBMFX is the fund for you. VBMFX has a low expense ratio of 0.16 percent and a $3,000 minimum initial purchase. Fidelity Total Bond (FTBFX): If you're looking for a broadly diversified index fund that can potentially capture higher returns than similar funds in the long run, FTBFX is a fine choice. This bond fund holds over 2,700 bonds, but it's more concentrated than VBMFX, which holds over 10,000 bonds. The result, at least historically, is that FTBFX can potentially deliver superior returns in the long run (i.e. 10 years or more) taking a bit more risk, albeit in a smart way. FTBFX has a low expense ratio of 0.45 percent and has a minimum initial investment of $2,500. Vanguard Intermediate-Term Bond Index (VBIIX): This index fund focuses on what might best be described as the "sweet spot" of bond investing — the intermediate-term bonds. Short-term bonds have a lower relative market risk, but they also produce lower yields and returns in the long run. And long-term bonds can potentially produce better yields and performance. They carry more market risk in the short run than intermediate-term bonds. Therefore, with VBIIX, you get a great balance of risk and return, all with a low expense ratio of just 0.16 percent. The minimum initial investment is $3,000. Long-term investors who don't mind taking a bit of extra market risk might want to consider a bond mutual fund that can buy any type of bond in a variety of different markets. These bond funds are normally categorized as "multi-sector" bond funds because they hold several different types of bonds, including the riskier high-yield bonds and foreign bonds. Loomis Sayles Bond (LSBRX): Bond funds like LSBRX can produce stock-like returns in the long run, but you'll need to be prepared for significant declines in tough markets. For example, when the economy tanked in 2008, LSBRX fell -22 percent. However, it jumped 37 percent in 2009, when the recovery began. For long-term periods, history reveals that the risk can be worth it and LSBRX can significantly beat the bond fund averages. The expense ratio is reasonable at 0.89 percent when you consider the experienced management team. The minimum initial investment for LSBRX is $2,500. Pimco Income Fund Class D (PONDX): If you're looking for high yields and don't mind the higher relative risk that comes along with it, PONDX is one of the best bonds funds out there. This fund is best suited for investors with moderate to high-risk tolerance looking for high current income from their investments. Although the "bond king," Bill Gross left PIMCO, the company he founded still has one of the best reputations for high-quality bond funds in the mutual fund universe. PONDX has a below-average expense ratio of 0.79 percent and a minimum initial investment amount of $1,000. Investors wanting to keep taxes to a minimum may want to carefully consider the benefits of municipal bond funds, which are free of federal taxes and possibly free of state taxes (if the bond fund holds bonds within the state of the taxpayer's primary residence). Here we'll highlight municipal bond funds that hold bonds from all around the country. This will help maximize the potential for greater long-term returns and possibly higher yields. Vanguard High Yield Tax Exempt (VWAHX): Investors looking for a low-cost municipal bond fund that offers a smart balance of yield and return will like what they see in VWAHX. Not only does VWAHX seek to hold high-yielding bonds but it also has historically beaten over 95 percent of high-yield bond funds for 3-, 5-, 10- and 15-year returns. Combine that yield and performance with low expenses of 0.2 percent and a reasonable initial investment of $3,000, and you get one of the best no-load municipal bond funds in the mutual fund universe. T. Rowe Price Tax-Free High Yield (PRFHX): For those investors who want a bit more yield without too much-added price risk, PRFHX is a solid choice. Although the fund does hold the riskier high-yield bonds, it doesn't allocate as much to this junk bond area as the average high-yield bond fund. And the tax-free status of the municipal bonds makes this fund more attractive for those needing a ​tax-efficient fund for their taxable account. PRFHX has a low expense ratio of 0.69 percent and a minimum initial investment of $2,500. 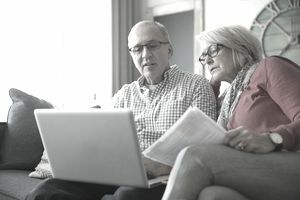 USAA Tax-Exempt Intermediate-Term (USATX): If you want to add a highly rated, well-managed municipal bond fund to your portfolio, USATX is an outstanding fund to consider. A core feature of this five-star fund is the management team which has been in place since the 1990's, which is a long time in the mutual fund industry. This experience has yielded above-average performance compared to other funds in the tax-exempt mutual fund category. The expense ratio is far below average at 0.55 percent and the minimum initial investment for USATX is $3,000. While this list of bond funds does highlight some of the best you can buy in the fixed income universe, you can always go out and do some research of your own. Or, you may want to double-check the quality of these funds for yourself and do a bit of extra homework to be sure they are suitable for your risk tolerance and long-term investment goals. When searching for the best bond funds for long-term returns, you can all but ignore the yields and focus more on the 5-, 10- and 15-year returns for an idea (not a guarantee) of how the fund might perform over the next decade or so. Bond funds are generally lower in market risk than stocks, and bonds can rise in value even as stocks decline, but the best use of bond funds is to use them in combination with stocks funds for a diversified portfolio of mutual funds.